Webcam Alanya: Livestream Turkish Riviera - View over Cleopatra Beach in Alanya . Alanya: Livestream Harbor, 0.5 mi. Alanya: Beach Panorama, 1.4 mi. Kargicak: View towards Mahmutlar and Alanya, 8.6 mi. Kargicak: Goldcity Alanya, 8.8 mi. Antalya: Hip-notics Cable Park Antalya, 50.7 mi. Belek: Xanadu Resort Hotel - Xanadu Bar, 52.9 mi. Belek: Livestream Archipelago, 52.9 mi. 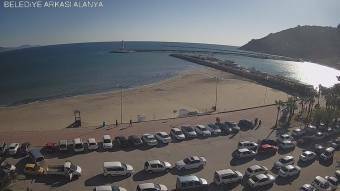 This webcam Alanya with the theme Seaview was added on May 1, 2006 and is operated by Alanya'nın Resmi Web Sitesi. It got 789948 visitors since then. Shouldn't this webcam work or should the link be wrong please report that here. You can add this webcam here to myCams.